PokerTH is a poker game written in C++/QT4. 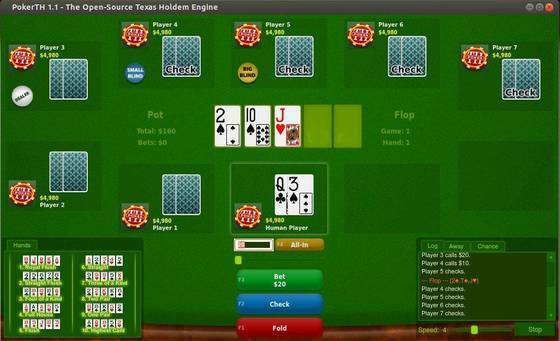 You can play the popular “Texas Hold’em” poker variant against up to 9 computer-opponents or play network and internet games with people all over the world. This poker engine is available for Android, Linux, Windows, and MacOSX. The latest PokerHT 1.1 has been released recently with following changes. This release has been made into Ubuntu 14.04 universe repository, so Trusty users can just install it from Ubuntu Software Center. Once installed, open the game from Unity Dash or Menu and enjoy!